Styled with 501 crop and alyona jacket . 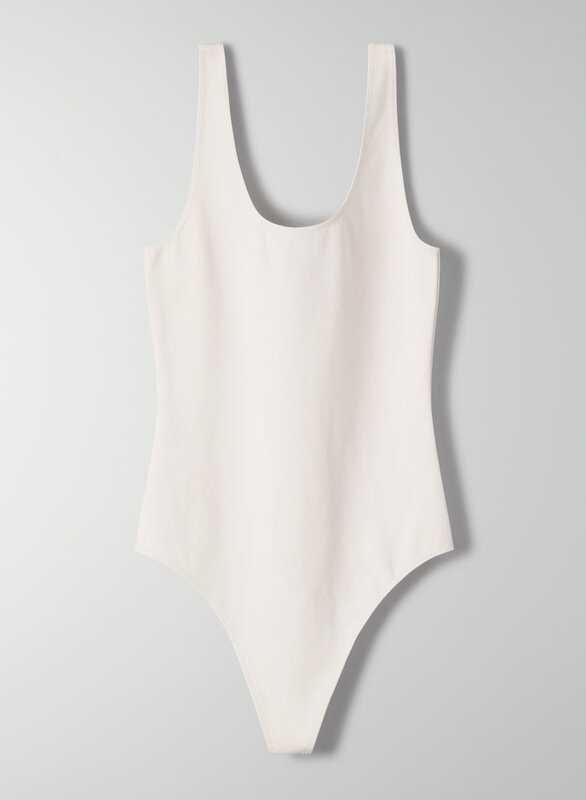 This bodysuit is made from a naturally breathable cotton blend with the right amount of stretch so it hugs you in. I'm on the taller side (5' 8") with a slim build/ no chest, so I sometimes have trouble finding bodysuits which are long enough without being baggy. I usually wear XS in tops but I got a size S in this and it fits perfectly! I love this bodysuit. Love it with the cropped tops and high waisted jeans. Makes the cropped tops work for work days! I absolutely love this body suit. I have this bodysuit in 4 different colours and each come in the exact colour you see in the online picture. Its absolutely perfect. Very easy to dress up or down, comfy. Sometimes it'll run small, I have found that in 1 of the 4 I have. The fabric is so comfy and flexible. Definitely recommend! If you have a longer torso, I recommend going a size up! Other than that the fabric fits amazing and is really comfortable.